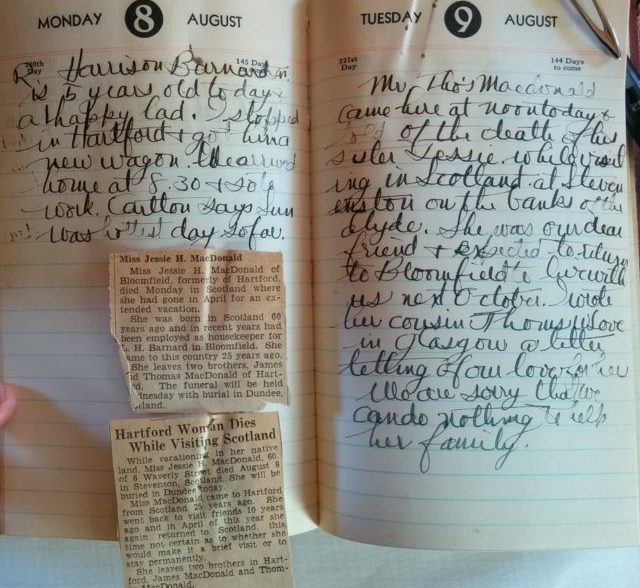 From Raymond Harrison Barnard (1893 – 1947) this entry for August 9, 1938 is about Jessie H. MacDonald’s death in Stevenson, Scotland; “our dear friend”. She was the family’s housekeeper for 25 years and had been visiting her birthplace in Scotland when she passed away unexpectedly at age 60. My mother remembers the family’s grief when they received the new that she had died right about the time they expected her to return. 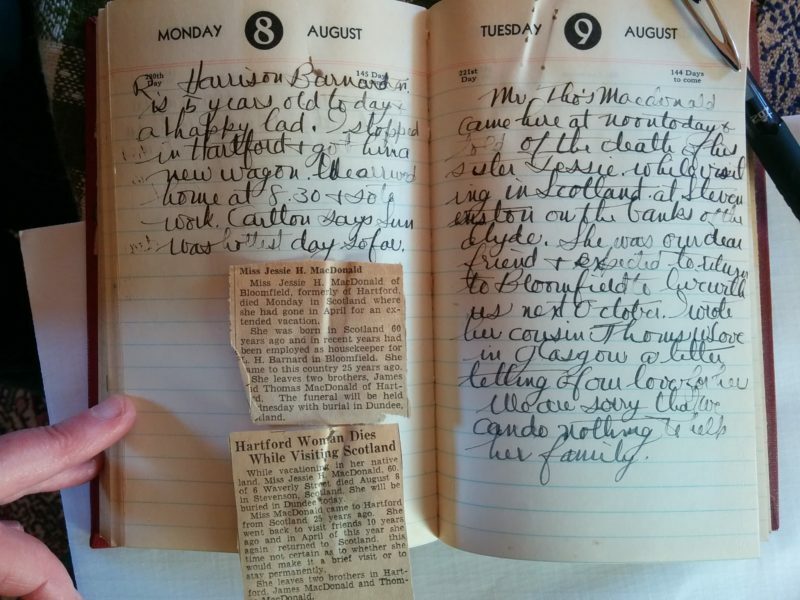 RHB’s journals are always inked in his lovely, loose scrawl and annotated with clippings and letters. Benjamin Isaac (BI) Miller (1868 -1949); BI’s journals are done in pencil, interleaved with bills, receipts, and solicitations addressed to “The Mayor, Hartford Connecticut”. This little drawing of the farm is done on the back of a letter and carefully taped together with linen strips on the back. From BI’s journal in 1914, a mimeograph from the Hartford County Rural Development Association encouraging us to “buy local” more than a century ago. It’s still a good read. 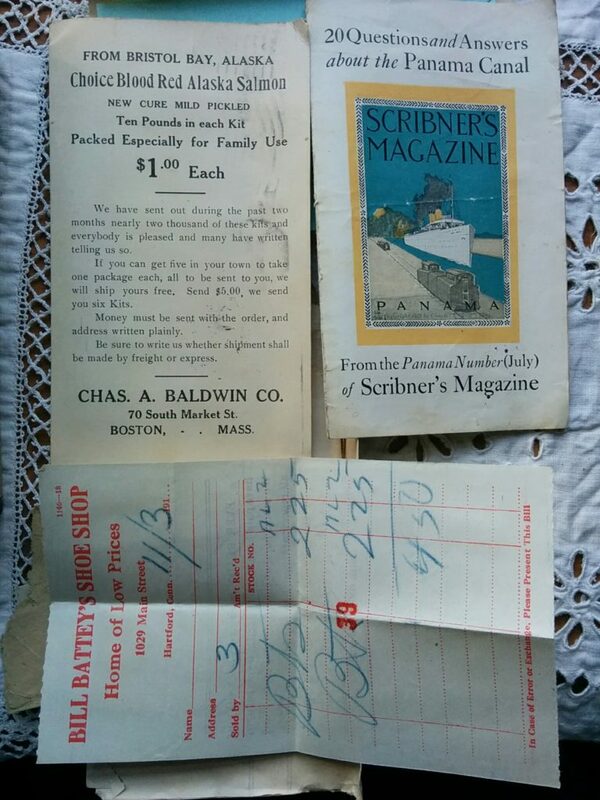 Both men were fond of including pamphlets and advertisements in their journals. They wrote about attending presentations at the Grange and Masonic Halls on tuberculosis, infantile paralysis (polio) and the Mile of Dimes, eye exams, air raid protocols, and the latest news from Washington DC. Here’s a selection from RHB’s journal about the Panama Canal, which opened on August 15, 1914. There’s a wealth of material about everyday life in the last century in these little books. Consider contributing to your local historical society to help them preserve your past. These journals will be at the Wintonbury Historical Society in Bloomfield, Connecticut. 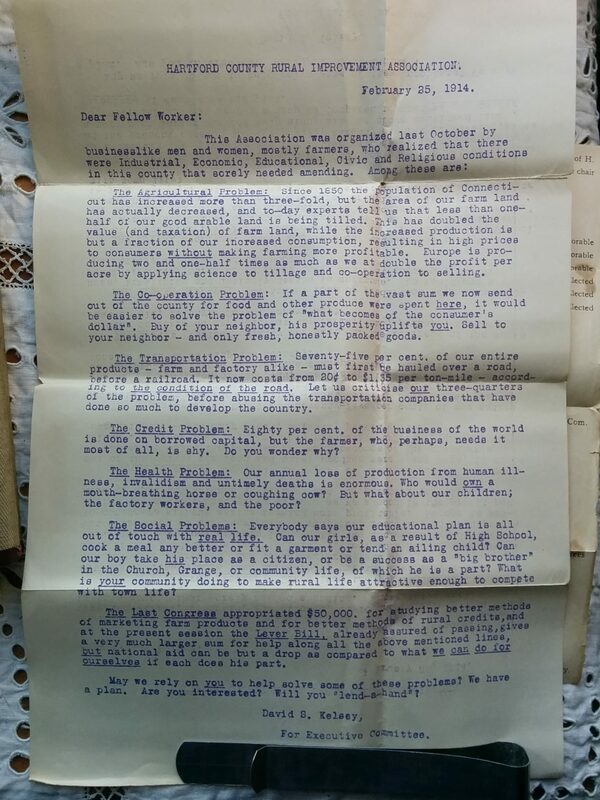 This entry was posted in family, gone but not forgotten, The Journals and tagged family, hardy ancestors, rememberance, winter on February 5, 2017 by APo. So glad these will be preserved, stewarded, and cherished. And, who knows. Some researcher may muckle onto the trove and come up with another take on social history. Cherished.